I couldn’t handle any situation successfully without talking to the one in heaven. Be stressed or just pray? Receive peace. God will take care of it. 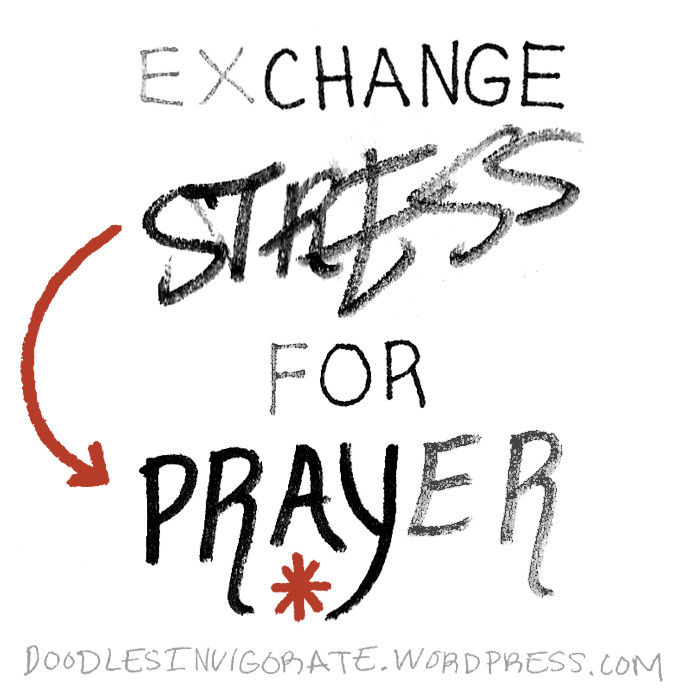 Exchange stress for prayer. I do this all the time! When things get “tight,” and stress or anxiety start to set in, I pray. I ask for the peace and comfort only God can provide and He does answer with it! BTW, thank you for asking, but I’m now back from my travels and rather enjoyed the East Coast. We got poured on the last 3 days of our trip, but found ways around that for the most part. We visited NYC, D.C., Baltimore, and Gettysburg. I think Pennsylvania was my favorite state! It is so different from anything in California. Awesome! I’m pretty familiar with all of those cities except Gettysburg. I’m sure I would have the same reaction about going to the west coast. It’s always nice to travel!